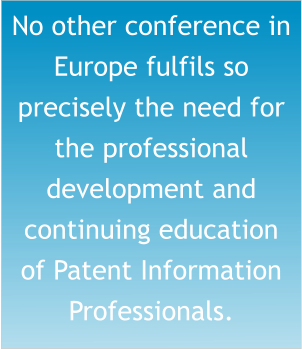 IPI-ConfEx is of direct interest to information managers and patent searchers and is particularly noted for its coverage of leading-edge ‘how-to’ technical discussions and reviews of information resources. Commercially-available products and services, free patent databases and other unique resources available worldwide for intellectual property research all form part of the program, as well as issues generally affecting the industry. Additional workshops provide optional training/learning opportunities and a chance to brush-up on the latest searching techniques. 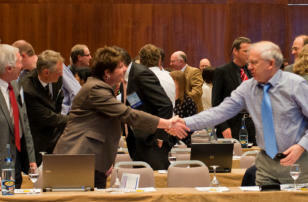 Don’t miss out on your opportunity to: • Learn best practice methods for implementing patent searching and management solutions from the point of view of other experienced patent information searchers and managers from leading corporations • Get updated on patent office future plans and other industry news to understand how this may affect your information work • Keep your patent searching skills current through attending presentations and special vendor workshops, learning practical methods for enhanced patent information retrieval, analysis and reporting • Benefit from the special IPI- MasterClass™ session, which provides an in-depth look at one particular topic of high interest • Network with other information professionals from leading corporations throughout Europe and internationally • Meet key vendors of patent information products and services in the exhibits hall – attending this one event every year allows you to keep fully up-to-date with vendor offerings • Hear case studies and comparisons of different patent information applications that you can take back to share with your colleagues and apply in your own work environment • Gain insight into legal aspects of reviewing patent information and how this affects patent information management and searching • Meet with members from national patent information associations and other associations representing your industry segment, to find out what is going on with patent information users within Europe and elsewhere.